We are a behavior change company. Adopting a new building technology, called Passive House, may be one of the easiest and least costly ways to greatly reduce carbon emissions around the world. Buildings are responsible for about 40% of all carbon emissions in the U.S. and globally but a switch to Passive House buildings (hereafter referred to as passive buildings) can reduce this number drastically. The reduction of emissions would result from a reduction in energy demand as opposed to the conversion to a different energy source. This is significant because a reduction in total global energy demand, as opposed to only a conversion to a renewable energy sources, is necessary to reduce emissions to the levels required to curb warming. The reduction in emissions from each passive building also lasts for life of that building and the longevity of a building can be a hundred years or more. Put another way, a conventional building constructed today could be a source of carbon emissions for a hundred years. Furthermore, unlike many other methods to address climate change and reduce emissions, this technology is not years away. It exists now and is being used in all regions in the U.S. and in all major building types (as well as in Canada, Europe and China). Unlike the transportation and energy sectors, this technology can be adopted without massive investments in infrastructure or changes to the economy. In fact, it is relatively inexpensive—with the cost of the buildings comparable to ones using conventional construction methods. Finally, the adoption of passive house building doesn’t require a shift in the public’s beliefs about climate change or appreciation of it as a danger. The buyers of homes and buildings do not need to be motivated by concerns about climate change because the other benefits (including health and financial benefits) make it superior to conventional buildings even when its environmental benefits are discounted, which makes it possible to sidestep politically contentious arguments about the environment when discussing the technology. In other words, most emissions from buildings are now avoidable. So what is necessary for large-scale adoption of passive house technology? Why is the market for these buildings currently so small? What needs to occur for it to replace conventional construction as the standard method of construction? With $1.2 trillion of new construction each year in the U.S. and with each new conventional buildings locking us into new emissions, these are urgent questions. What we claim in the following pages is that there is a need to make a market through demand-side initiatives, that there is a way to make a market and that there are a number of important benefits to doing so. Of course, it’s not difficult to conceive of large policy initiatives or aggressive financial incentives that would push buyers in a number of market segments toward the adoption of passive building. However, the purpose here is not to devise a wish list of such policy initiatives and incentives. Nor is it to wait for resources and support that is neither currently available nor easy to secure. The purpose of this analysis is to find ways to make a market for passive buildings in the absence of these resources and support so that large scale adoption of this technology can occur as soon as possible. Big Yellow Cab conducted a thorough literature review and held key informant interviews with developers, architects, realtors and home buyers over the course of 12 months in order to learn the barriers to adoption of this technology, uncover the behaviors and attitudes driving the market and learn the competitive strategies being employed by builders and architects. Findings from this research are discussed throughout this analysis. With this research in hand we studied what was behind an individual’s decision to opt for (or against) a passive building. We did so using evidence-based behavioral models that have been used in hundreds of different applications and areas, and that are supported by 40 years of peer reviewed social science research. What is making a market? If you hold a marathon, you’ve just made a market for bottled water and t-shirts. If you open a park, you’ve just made a market for ice cream. Making a market is changing a set of circumstances so that there is demand in a new area. Build the internet and you get a market for web design and email services and programming. Over the last few years, sharp growth in the number of passive building projects. There is also growing enthusiasm for the standard among policy makers. However, to date, there are only about 300 passive buildings in the U.S. and this in an industry which adds roughly $1.2 trillion of new building construction each year. So, despite its growth rates, the market is still nascent and uncertain. The market share of passive buildings (versus conventional construction) is less than 0.1% of the market. So current growth calculations rely on a very small denominator and demand is extremely modest relative to the size of the market as a whole. In fact, most lenders do not acknowledge the benefits of passive buildings when processing loan applications and the awareness of passive house in the population is low. One bright spot in the adoption of passive buildings is in the area of affordable housing where changes in the way those projects are awarded have increased the rate of adoption. Another bright spot is the sizable initiative by New York State to support the development of scalable passive building retrofit systems. Certain regions (such as New York City and Massachusetts) have also implemented building codes supportive of passive buildings. Finally, the enthusiasm for this technology among builders and policy makers is on the rise. But what are the prospects of a full adoption of this building standard in the U.S. and elsewhere? Can we expect there to be a rise in demand sufficient for passive buildings to have a significant share of the market? Just as importantly, what would fuel that growth? It can be difficult to predict demand for any new product but there are ways to see where the market is going and what is driving demand—and how fast. There are also certain indicators that can suggest a products prospects so that it’s not necessary to rely on guesswork or merely hope that the current growth rate represents a trend. Obviously, there is a lot of variability within the building industry and this can complicate efforts to get a picture of what is going on within it. So we started by isolating certain sections of it. We divided the market into categories determined by the buyers, funders and end users of a particular building type (see the chart below as an example). This allowed us to focus on the various circumstances shaping that particular market segment and see what barriers and incentives might exist for buyers, funders and end users in each market. With the indicators below it is then possible to see what is driving demand within that niche or market segment and what can be done to increase it. Finally, we can see if this information is in agreement with what builders, architects and realtors have encountered when speaking with buyers (of different building types). We can also see if it agrees with the current adoption/rejection rate of buyers who are given a choice between a passive building and a conventional one. Our analysis found that a number of barriers exist that are likely to significantly limit demand and prevent a broad-based adoption of passive buildings unless addressed through market based initiatives, policy initiatives or government incentives. The barriers we found are in addition to those cited elsewhere (such as low awareness, the split incentives of developers, the failure of lenders to recognize the standard or the lack of data about resale value). This causes there to be a disparity between the relevance to buyers and end users of the attributes of passive buildings and the subjective importance of those attributes when the purchase or occupancy decision occurs. In other words, the way buyers, funders and end users measure value is an impediment to widespread adoption of passive buildings. But the way buyers and end users measure value is a problem for them too. Beginning Of Decision Process. The buyer and/or end user begins the search for a building and follows a number of common practices and procedures. Purchase Or Occupancy Decision. The subjective importance of the attributes of passive buildings are low. After A Period Of Ownership Or Occupancy. Buyers and end user earlier decision results in costs, regret and unmet needs. The perceived needs at the time of the purchase or occupancy decision are different from the real and perceived needs at a later date. The way buyers measure value fails to take certain things into account and results in costs, regret and unmet needs. The subjective importance of the unmet needs is roughly equivalent to the amount of regret. In order to understand what occurs in the decision making process, and to see how what occurs there causes buyers and end users to undervalue the attributes of passive buildings, we examined the process through a number of behavioral models. The models allowed us to see a number of barriers often not considered in current discussions about the passive house market (which often focus on cost), how these barriers reduce the likelihood that a buyer will opt for a passive house over conventional construction and how to surmount these barriers. The barriers discovered through this process were mired in issues of perception, control and efficacy. See Appendix A and B for a description of the Theory Of Planned Behavior and the Stages Of Change. Behavioral models have been used to predict behavior change program effectiveness from tobacco cessation and obesity prevention to medical self-examination. We relied principally on two models. 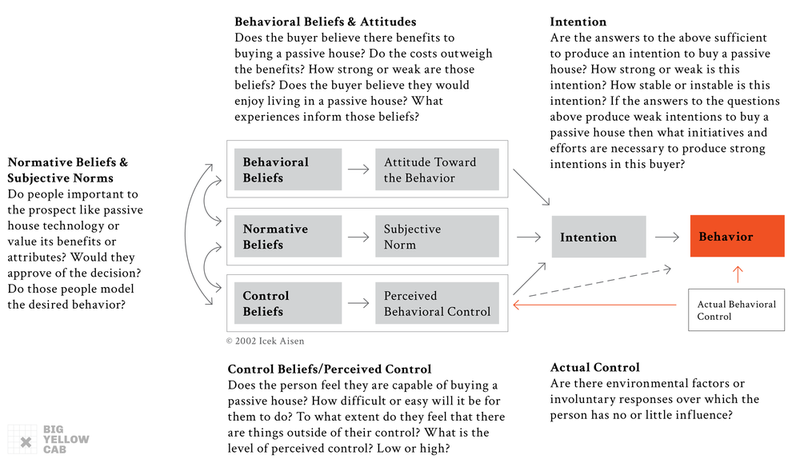 Ajzen and Fishbein’s Theory of Planned Behavior: This model explores how beliefs influence an intention to perform a behaviors and it allows a researcher to predict a behavior or assess how likely it is. For example, how likely is it for a person who recently bought a gym membership to stick to an exercise schedule? Prochaska and DiClemente’s Stages of Change Framework: This model explores the five stages inherent in the decision-making process to change one’s behavior. For example, what occurs as a smoker first begins to consider the benefits of quitting and what is necessary for them to successfully navigate that process? The benefits of these models are twofold. They can be used to find the underlying factors behind a behavior and they can be used to find levers to elicit the desired behavior. We used these models to identify the beliefs and intentions related to decision to opt or not opt for a passive building, as opposed to a conventional one, and to see what occurs in the decision-making process. Our findings were consistent with the experiences of architects, developers and home buyers. Which is to say that there are significant behavioral (as opposed to financial) barriers to the widespread adoption of passive house buildings. The demand for passive buildings is modest relative to the size of the market for conventional buildings and, though this market may continue to grow, our analysis suggests that broad adoption of this building standard is unlikely unless there are demand side efforts to address certain barriers. Furthermore, we expect these barriers to limit demand even if there are higher levels of awareness about passive building and even if there is parity in construction costs. So what change in circumstances will result in the existence of a new (or more robust) market for passive buildings? Because this is basically a contest between to alternatives (conventional construction versus passive building standards), we can state the question this way. 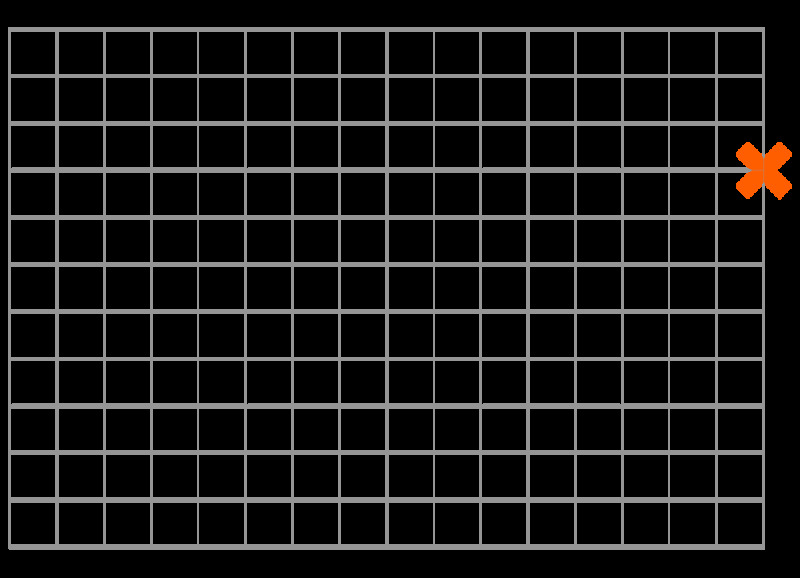 What change in circumstances will result in (one) an increase in the perceived costs of conventional construction; (two) the proper pricing of the risks of conventional buildings to owners and occupants; (three) an increase the perceived value of the attributes of passive buildings; and (four) an intention to base purchase and occupancy decisions on this information? A market is best understood not as a group of a transactions but as a desire to satisfy a need or number of needs. Those needs would best satisfied by a passive building for those who met the conditions above. There are a limited number of behaviors and perceptions that are responsible for people’s tolerance for the risks and costs of conventional buildings. Changing these behaviors and perceptions will lower people’s tolerance for those risks and costs and result in a strong market for passive buildings. Let’s turn to a concept used elsewhere to see how to produce this change. The concept is of a risk behavior. A risk behavior is a term behaviorists and those in public health use to describe a behavior tied to certain negative outcomes. Smoking is a risk behavior. An eating habit that results in obesity or diabetes is a risk behavior. There is also a process for how to respond to a risk behavior. This process is rigorous, evidence-based and effective in reducing the incidence of the behavior. One: Point out the risk behavior (smoking). Two: Look at the negative outcomes and their costs (lung and cardiac diseases, mortality). Four: See how to change that behavior (using behavioral models to design an evidence-based intervention tailored to that population). The last step involves seeing what mechanism is most effective in changing the behavior and the most feasible in terms of implementation. This same process is used if the behavior is reckless driving or eating habits or the hand washing routines of doctors. Basically, it’s about seeing what’s behind the behavior and then finding ways to change it. The methods and procedures have been subject to numerous studies and are shown to be effective across different domains. In fact, one National Cancer Institute resource lists 127 evidence-based behavior change programs rated according to their impact and ease of use. Implicit in the process are the ideas that behavior is predictable, malleable, and dependent on a limited number of variables which are the same across different domains. Without this process, some barriers may be easy to overlook and those barriers would then continue to limit the impact of an effort. For example, a Community Free Mammography Outreach program studied the low-income residents of the county and found that the process to make an appointment, which involved a long phone menu, was a barrier to people who had expressed interest in the screenings from taking advantage of them. After the survey, the program opened an appointment hotline and there was a marked increase in mammograms to the underserved members of the community. We see three primary risk behaviors tied to the purchase, rental and occupancy of conventional buildings. Risk behavior one: Accepting chronic exposure to air pollutants. The negative outcomes include higher risk of respiratory and cardiac conditions, and aggravation of symptoms for those that already have respiratory conditions. Risk behavior two: Agreeing to financial obligations and liabilities before understanding those obligations or assessing their own ability to handle them. The negative outcomes are financial stress, default on obligations and loss of opportunities (such as education or retirement). Obviously, there are variations on this risk behavior. For example, a large company buying a commercial building will possess the financial acumen and processes to fully understand the costs and liabilities. However, the company would still face certain risks (such as the risk that fuel and operational costs will increase over time or that asset values will decrease due to those costs). Risk behavior three: Failure to account for the impact of fossil fuel based heating and cooling on the atmosphere. The negative outcomes are obviously worsening conditions with respect to climate change. Because of the many challenges involved in addressing this behavior we focus here on the first two. With these risk behaviors too the process begins by seeing what is behind the behavior and what barriers exist to prevent a person from adopting a new behavior. The process can also be used to study the behavior of other participants in the building ecosystem (such as lenders or realtors) and find opportunities in this ecosystem to shift the market. The purpose of adopting this perspective is not to equate the dangers of smoking to the costs of owning a conventional building. The purpose here is only to show that there is a way to think about these behaviors as well as procedures to address them. These procedures can be used to address the risk behaviors and reduce the barriers preventing a person from opting for a passive building. The costs associated with conventional buildings may not be as severe for individuals as those of smoking. But the costs for individuals are serious and effect most of the population. Radon is the second leading cause of lung disease behind smoking and financial stress as a result of unanticipated costs is common. Those are some of the individual costs. However, there are social costs too, such as the consequences of CO2 emissions or the social costs of financial distress. But why can’t you just tell a person to look out for mold or to add up possible repair costs before buying a house? The answer is because behavior doesn’t work that way. The answer is that there is a difference between knowing and doing. There are many determinants of behavior and by itself information is insufficient to elicit a behavior even if that information succeeds in changing an attitude toward a particular behavior. So convincing a person of the benefits of a behavior is necessary but it’s only the beginning. Many organizations have capable communications and marketing people and, with that being the case, organizations may wish to equate awareness campaigns with behavior change. That would be a mistake. Telling audience segments that a passive building is “better for them” and listing proof points is useful but that process is not designed to identify the barriers to action or bring those segments from awareness to action. Below we can see the difference in performance between a typical communications effort (the information only group) and behavior change program (the intervention group). In addition to the primary risk behaviors described earlier there are a number of associated risk behaviors. These contribute to primary risk behavior in the same way spending time in a bar with friends who are fellow smokers may make it more likely a person will pull out a cigarette. Decisions are often thought of occurring at a single instant in time resulting in a “yes” or “no” but a decision is less like a flash than a train that follows a track and is diverted one way or another by switches along the way. Each switch diverts the person along a certain route with each route possessing some options and lacking others. The associated risk behaviors divert people away from the decision to opt for a passive building—and so contribute to the status quo. Visible are a number of attitudes and beliefs that direct people away from the choice to opt for a passive building, such as the belief among some home buyers that operating costs are basically the same from one house to another or the belief there’s nothing that can be done to reduce such costs. Here’s a small sampling of associated risk behaviors and desired behaviors. The decision process to opt or not opt for a passive building occurs over time as an individual talks to lenders, meets with architects, reviews listings for properties or rentals and seeks out information from a number of sources. With information about what contributes to a risk behavior and who and what influences that decision mechanisms can be developed to change behaviors and attitudes. This is the focus of our current efforts. We’ve looked at the behavior and motivations of buyers, funders and end users for a number of building types. We’ve also looked at the behavior of other participants in the industry ecosystem. From this research (and with the understanding that each mechanism must be effective, inexpensive and easy to distribute) we’ve started to develop a number of mechanisms that can be applied in different areas of the ecosystem. For instance, a mechanism can be designed to address the tendency among buyers, funders and end users to discount the value of recurring costs. A mechanism can also be designed to address an individual’s beliefs about how much control they have over the quality of their indoor air. What makes this discussion possible are the many accomplishments of building scientists, architects and organizations (such as PHIUS and Passivhaus Institut). Without their efforts there would be no viable alternative to conventional buildings and a performance-based building designed for its own climate would be no more than an idea. The many technical, logistic, aesthetic challenges involved in the development of a new building standard (one that holds such promise for reducing CO2 emissions) were resolved through their efforts. In the context of supply and demand these efforts (capacity building and product development) concern the availability of this technology or of its supply. Now there must be a corresponding effort on the demand side. What is needed on the demand side are mechanisms that decrease the tolerance of buyers, funders and end users for the costs and risks associated with conventional buildings—and increase the subjective importance of the attributes of passive buildings. That said, the supply side efforts such as capacity building (training) and product refinements (for instance, reducing embodied costs) must continue so that there are no supply constraints as the market for passive buildings grows. A number of behaviors are complicit in the acceptance of the risks and costs associated with conventional buildings. Changing these behaviors will result in an increase in the perceived costs of conventional construction and an increase the perceived value of the attributes of passive buildings. However, in our view, a failure to address these behaviors will significantly limit the demand for passive buildings. It’s necessary to take behavior into account when examining how to increase the adoption of this technology. A person buying conventional house, for example, is basically signing a blank check by accepting liabilities and costs, the size and significance of which are unknown to them, that are not disclosed to the person prior to the sale. A person occupying a conventional building is, often unwittingly, exposing themselves to an environment containing radon, particulate matter and VOCs. These behaviors have high individual and social costs and yet they occur everyday. We often imagine people to be fully rational beings capable of doing an effective cost benefit analysis when making important decisions. However, such people exist only in our imaginations and when thinking about buying and rental decisions it’s important to think of people as they are (not as how we imagine them to be) and closely examine the process by which people make decisions. Though initiatives designed to address the risk behaviors are likely to be the most cost effective way to convert the market, it’s important to note the challenges to implementing efforts to drive up demand for passive buildings. The building industry is a largely fragmented industry and this results in a coordination problem between the players in the industry. The fragmentation can make it difficult for the players to make the necessary investments in the development of that industry. The example below illustrates the difference between what occurs in a consolidated versus a fragmented industry. What would a dominant soda company do in the following scenario? Let’s say there’s a country with only state owned beverage distribution centers but one region in the country lacks a distribution center and this is hurting the company’s sales in that area. Would it make sense for the soda company to fund the construction of the distribution center in that region even though it would be state owned and all soda manufacturers could use it to distribute their products? Company A (in a consolidated industry) with a market share of 50% invests a $100 to solve an industry wide problem and this effort produces $1000 of incremental revenue. Company A gets $500 of this incremental revenue with a profit of $400. Company B (in a fragmented industry) with a market share of 1% invests a $100 to solve an industry wide problem and this effort produces $1000 of incremental revenue. Company B gets $10 of this incremental revenue with a $90 loss. The company will ask, What is our return if we fund what will be a state owned distribution center that all beverage companies could use? Do the benefits of this investment accrue to us? Because it’s a consolidated industry with only a few players, each with a large market share, the answer is likely to be yes. When it comes to developing the passive building market and funding demand side initiatives, individual firms are limited in what they can do. Firms may be too small to make significant investments and, if they did make such investments, may only reap a small portion of the benefits of an investment in the category because the rewards are broadly shared between a number of firms. The result is a relatively low spending on initiatives to develop the market. There is a third scenario in the example above. Company C with a market share of 1% invests a $1 through an associations or organizations to solve an industry wide problem and this effort produces $1000 of incremental revenue. Company C gets $10 of this incremental revenue with a $9 profit. What is necessary to solve the coordination problem is an entity (or a few entities) to fund demand side initiatives. This entity can be a new one or an existing one. The only criteria is that making a market for passive buildings be its (or their) primary function. In addition to funding initiatives aimed at reducing risk behaviors and lower the barriers for adoption, these organizations can coordinate with those organizations with complementary missions and invest in policy change. The organizations currently driving up demand for passive affordable housing by lobbying state agencies to modify the way projects are awarded are a good example of what is being described here. Driving up demand must be the entities primary function in order to avoid problems of resource dependency. Projects can languish or die in companies and organizations where other priorities cause the project to be deprived of sufficient resources. One famous example is Sony’s failure, due to internal conflicts, to enter the very lucrative MP3 player market long before Apple’s release of the iPod. An entity dedicated to a single purpose would have no such conflicts. An entity whose sole purpose was to spur demand for passive buildings could attract resources from diverse sources and make the investments deemed necessary. This entity could also partner with likeminded funds, foundations and organizations. The organizations and foundations whose missions are served by the benefits of passive buildings (and the reduction of the negative outcomes of conventional buildings) are obvious allies to passive building architects and advocates. There are obviously numerous organizations dedicated to reducing the severity of respiratory conditions or to reducing CO2 emissions and each year these organizations spend billions to address issues important to them, the same issues that would be advanced by the widespread adoption of passive buildings. However, assistance from such organizations would certainly be contingent upon direct and measurable progress on an issue. Without evidence that contributions would directly increase the number of people who live in environments with high air quality or the number of buildings that reduce CO2 emissions, these organizations are unlikely to participate in these efforts. There are other challenges too, such as the danger that companies with an interest in conventional construction use obfuscation to misinform the public and push people to less efficient buildings or ones constructed using less rigorous standards. Such companies may divert investors, developers and others to inferior practices (selling people conventional buildings under the misleading banner of “high energy efficiency” buildings). However, these challenges exist in the current environment and can best be addressed by an entity focused on fostering demand in passive building standards. The scale of the efforts on the demand side should reflect the benefits that accrue to those behind those efforts. There are important benefits to making a market. The widespread adoption of passive buildings will result in a significant reduction of CO2 and a reduction in the negative financial and health outcomes associated with conventional construction. These on their own justify demand side efforts. However, there would be significant benefits for those involved in the demand side efforts, such as passive building architects and builders. There’s also a strong business case for architects and builders for market based initiatives. Elimination of the need to wait for a market to appear. Price is an important variable in any product strategy but for passive buildings to win a large share of the market the focus must be on difference and not on price. Reducing people’s tolerance for the costs and risks associated with conventional buildings (by changing the behaviors that allow people to ignore those costs and risks) will make the difference more salient to buyers, funders and end users. In other words, reducing risk behaviors will make it possible for architects and builders to employ a strategy based on difference as opposed to price. For example, clients often ask architects about the price per square foot of a building. Behind this question are often a number of assumptions about what a building is (Is it a commodity about which you can do an apples to apples comparison?) and the relevance of the buildings operational costs (Are they assumed to be all the same?) that can push a person toward the risk behaviors and toward the purchase of a conventional building. The way an architect answers this influence where the buyer travels along the decision tree, if they go in the direction of a passive building or if they are diverted toward the decision to opt for a conventional building. If the architect is employing a strategy based on difference or if the costs and risks associated with a conventional building are salient to the client, it’s far less likely the client will do comparison shopping between conventional buildings and passive ones. Actions characteristic of price competition may even slow the rate of adoption of passive buildings. Price completion occurs between identical products or products that are not substantially differentiated in the customer’s eyes and so price competition between passive buildings and conventional ones will result in pressure on what can be charged for energy modeling and design. (This is not to say that efforts to achieve price parity in the constructions costs between conventional buildings and passive buildings are not important. Progress here will accelerate the adoption of passive technology and allow the sellers of passive buildings to use a dominant product strategy where the product is both better and less expensive than competing products). Historically architects may have differentiated their services by, for example, the aesthetics of their buildings or by logistics but when selling passive buildings it’s important to add the outcomes associated with avoiding the risk behaviors. The difference between passive buildings and conventional ones are vast but these differences must be salient to buyers, funders and end users. These differences cannot be understood as small improvements over existing building standards but must be significant enough to overcome the bias toward the familiar (a bias which can increase under certain circumstances and which can be called regret avoidance). Product strategies based on difference (“better product/more expensive” or “better product/less expensive”) will draw buyers and funders away from a commodity market comparisons between passive and conventional buildings and change the context in which the price question is asked by buyers. The process of making a market are likely complement efforts to drive policy change because developing market driven initiatives will produce an environment more conducive to policy change. Altering what buyers, funders and end users expect from a house will lower the tolerance policies that foster the construction of buildings that fall short of those expectations. Given the importance of the issues, it makes sense to drive change through policy and market driven initiatives. Those in the building ecosystem can benefit greatly from demand side efforts. Our analysis found that a number of behavioral barriers exist that are likely to prevent a broad-based adoption of passive buildings unless addressed through market based initiatives, policy initiatives or government incentives. The barriers include a number of risk behaviors, conventions and perceptions, such as how people discount recurring costs like heating bills or the method homebuyers use to determine affordability. However, mechanisms can be developed to reduce these barriers and make the choice in favor of a passive building more likely. Such mechanisms can make a new market for passive buildings and speed adoption of this technology. The advocates of passive building (architects, builders, building scientists and others) have invested an enormous amount of time and energy to develop and refine this technology, and to make it superior to any alternative technology. Now the focus must be on making a market through demand side initiatives. Ajzen and Fishbein’s Theory Of Planned Behavior is an evidence-based theory designed to predict if an individual will perform a certain behavior and to be used when developing programs to change behavior. The model shows the variables behind a behavior and gives behavioral scientists a framework to identify what barriers might be preventing a person from adopting a behavior or from changing an existing behavior. Numerous studies have shown Theory Of Planned Behavior to be effective in predicting behavior and it has been used successfully in hundreds of different applications. The Theory Of Planned Behavior was used in the analysis of the behaviors surrounding the purchase of a home and in developing mechanisms to change certain behaviors. Below we illustrate how the model can be used to inquire if a prospective home buyer will, after meeting with an architect, opt for a passive house over a conventional one. Prochaska and DiClemente’s Stages of Change Model is an evidence-based theory designed to illustrate the pathways people take to change their attitudes or behavior. This model was originally developed to focus on health-related behaviors, its applications extend to behaviors that improve quality of life such as environmental and civic advocacy. It has been used to design behavior change programs over many different areas. What Is A Hidden Lever?